Cows farts, albeit stinky, are rich in methane gas, a greenhouse gas and a fuel source. Trapping those cow farts though is like trying to catch a wave upon the sand, but now researchers in Argentina are tapping into this un-utilized potential and capturing the gas with methane collecting backpacks. A tube stuck right into the cow’s rumen collects the gases and stores them in an inflatable sack on their back. Later the methane is purified and compressed so it can be used to generate electricity, run a refrigerator, cook or even run a car, all while keeping the methane out of the atmosphere. While the concept still needs more testing and development, as well as a serious look at the ethics, this is the beginning of Cowpower, the newest form of renewable energy. Methane is a very potent greenhouse gas, and according to the Environmental Protection Agency it accounts for 9% of all greenhouse gases in the US, with the Agriculture Industry and raising livestock being the primary culprit. Cows fart a lot and because we raise them and eat them, we’re responsible for those emissions. Up until now, accounting for these emissions has been a lost cause, because you can’t really stop a cow from farting and releasing greenhouse gases. Since methane is a useful and burnable gas, technically, we’re also just letting a good, valuable fuel just waft into the air. Argentina, which is big on beef, decided to look into the problem, so researchers at the INTA set about to capture that gas. 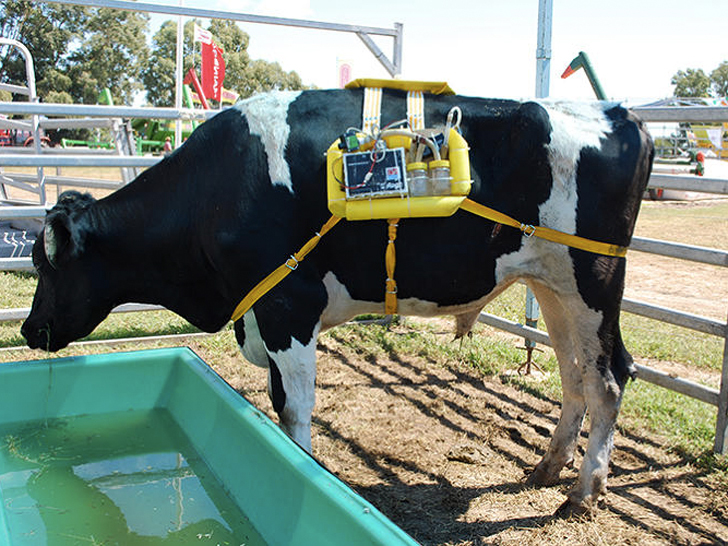 The team developed a methane collecting backpack consisting of an inflatable bag set on their back and a tube stuck into the cow’s rumen. The tubes were inserted through a small puncture in their side and received local anesthesia for the procedure. As the cow eats and digests grasses, gases are created, which move through the tube into the bag. After enough is collected, the researchers take the bag, extract, purify and compress the methane for use to generate power, electricity, heat and much more. RELATED | Is ‘Sustainable Leather’ Really Better for the Environment? The concept proved to be viable. 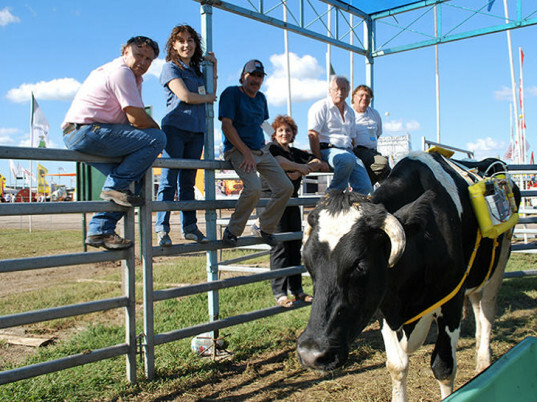 “A cow emits about 300 liters of methane per day, which can be used to operate a fridge capacity of 100 liters at a temperature of between two and six degrees for a full day,” said Ricardo Bualo, a technician involved with the project. The question for the team now is how to expand the concept into a working model for a large farm. We’ve got some big questions about how all this is done and how it might affect the cow, but ethics aside, collecting the gas could lead to a big renewable energy source and help reduce greenhouse gases in a major way. What do you think – should we exploit cows for their methane-rich farts? This is a good example of fallacy. Instead of resolving the real problem - cow farms that produce non-environmental-friendly meat in large scale - they are thinking in "solutions" like that and selling the idea of "saving the world". That is preposterous and ridiculous. Just to justify the production and keep filling the producers pockets. Same as the plastic recycling "solution" that keeps the production of plastic, even knowing it is possible to recycle it only 3 or 4 times. If you stop buying plastic and eating meat you will really save the world. This is utterly cruel and sick. Instead of coming up with decent ways of decreasing the inhumane use of non-human beings, you have come up with another cruel way of keeping on doing the wrong this. I'm disgusted, not only by this awful experiment, but also with the selfrigheous grins of the so called researchers in the photo. Horrible! This is disgusting. And it is NOT a solution. Eat less meat, produce less methane, use fields for produce. Sick. Really no need to collect methane like this, its not practical and has animal welfare issues. Remember cows are ruminants they belch methane out their mouth, they don't fart it. Methane emissions can be reduced by grazing high quality pastures which can in turn offset the CO2 equivalent produced by sequestering CO2 in plant matter, and soil organic matter. Ruminants managed correctly have a positive roll to play in providing ecosystem services across rangelands as well as food. We need to understand how. I have mixed feelings about this. While I agree with what the other commentators are saying, the concept does kill 2 birds (renewable energy source, greenhouse gas emissions) with 1 stone. Can't we work on solving the core issues of excessive meat consumption, and consumerism in general, while using this as a temporary solution to the millions of cows already being used in farms, on the side? A very interesting, although likely profit-fueled, solution indeed. I just wanted to add that the number of cows on planet earth is between 1.5 and 1.8 BILLION, One cow to every 6.5 people on planet earth. For this to be a real solution, it would need to be implemented widely....really widely. I also have mixed feelings about the humaneness of sticking a tube in the cows' stomach. Interested in other solutions that scientists/ farmers, etc are coming up with. I too would be concerned regarding animal health/welfare (risk of infection at the insertion site etc). The article, however, does state this is in a research phase perhaps there is a more effective way to harvest the methane from the animal. I do need to mention that this could also be implemented with dairy cows (something that commenters have overlooked). Assisting us with obtaining our calcium and protein needs, which can be difficult to meet with a strictly plant based diet (especially without increasing our own methane outputs - too many beans ;) ). I think it important to research many ways of "greening" our food supply and remember that a multichannel approach across the agricultural industry might be the best way to do this. Let's work with our farmers and researchers to develop a more sustainable food supply chain remembering farmers with happy and healthy plants and animals will produce better quality outputs that are healthy for people to consume. Cows farts, albeit stinky, are rich in methane gas, a greenhouse gas and a fuel source. Trapping those cow farts though is like trying to catch a wave upon the sand, but now researchers in Argentina are tapping into this un-utilized potential and capturing the gas with methane collecting backpacks. A tube stuck right into the cow's rumen collects the gases and stores them in an inflatable sack on their back. Later the methane is purified and compressed so it can be used to generate electricity, run a refrigerator, cook or even run a car, all while keeping the methane out of the atmosphere. While the concept still needs more testing and development, as well as a serious look at the ethics, this is the beginning of Cowpower, the newest form of renewable energy.